Quiet but very close to the beach but centrally. Tasteful and very well maintained. Property 51: Quiet but very close to the beach but centrally. Tasteful and very well maintained. Property 74: Conil ocean is an ideal place for people seeking quiet apartment. MARARA, your relaxing apartment on the beach. Property 79: MARARA, your relaxing apartment on the beach. 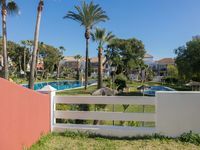 Townhouse at 600 meters from the beach of La Barrosa with POOL. SanctiPetri. 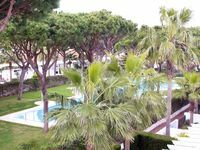 Property 99: Townhouse at 600 meters from the beach of La Barrosa with POOL. SanctiPetri. Nice new and plentiful equipment and crockery. Beds and bedding very comfortable. Good size rooms well arranged. The pool area looks very inviting although it was winter so we never used it. Parking was easy and plentiful. Insufficient electrical sockets in the kitchen. ONly one socket for toaster, microwave and kettle. The living room furniture rather cheap looking and shabby. The bathroom had some residual mould. The heaters provided during the cold spell were inadequate - convector heater very noisy and bar heater only had 1 of 2 bars working. The apartment was hard to find in the dark. The block numbers could be more visible to drivers or a map provided. None of these things were serious though.